A rendering of the proposed Main Street to be included in Seritage’s redevelopment of the Sears site. Hicksville residents filled the room inside the Hicksville Community Center last Thursday, Feb. 7, when project manager Larry Rose presented the latest plans Seritage has for redeveloping the former Sears site on North Broadway. 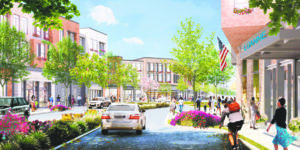 The Hicksville News last heard of Seritage’s plan for the area in late November when they were proposing a mixed-use complex consisting of retail and 566 residential units. At Thursday night’s meeting, Rose announced the latest plan will include a reduced amount of residences with 496 luxury units—60 percent being one-bedroom and studio apartments and 40 percent being two-bedroom apartments. Apartment residents may pay for a parking space in the enclosed parking areas within the residential buildings. Three buildings will house the residences, with 20-feet of retail on the ground level and two floors of 10-foot residences above, bringing the buildings’ total height to about 40 feet. The residential sides of the buildings will line Bay and Lenox avenues, preventing neighborhood homeowners from having to see retail when they look out their window. Other facilities include a grocery store with office space on the second floor on the corner of Bay Avenue and Nevada Street, a fitness center above retail space, a multitude of restaurants and, above retail, the first iPic theater on Long Island, which will include eight screening rooms of no more than 40 luxury recliners with waiting staff to bring food and drinks to guests during a movie. 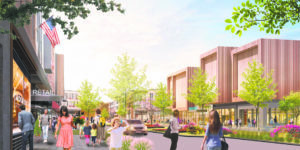 The plan also has proposals for five acres of greenspace, including landscaped buffers along Bay and Lenox avenues, a 90-foot village plaza circle, landscaped medians along the 1,000-foot Main Street, a market square and landscaped traffic circles. On-site already is TD Bank and Chipotle; these establishments will remain in their current locations with the current plan. Main Street, having drawn inspiration from other towns’ Main Streets, will include variations in design, color, height and signage to allow the stretch of retail to appear as multiple buildings rather than one long stretch of storefront. 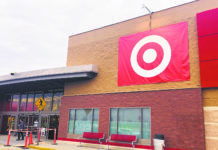 The proposed retail, Rose explained, is not to rival merchants in the Broadway Commons just across the street, but rather to encourage mom-and-pop-type stores to open in the complex and bring something new to the Hicksville community. Parallel parking, landscaping and outdoor seating are among the proposed amenities to supplement the Main Street area. As Hicksville is a transit-oriented town, the complex will also include shuttle service to the Hicksville Rail Road Station. Another rendering of the proposed Seritage redevelopment. With 496 residences and a wide variety of retail proposed for the 266,000-square-foot site, residents attending the meeting voiced their concerns about having enough parking. One concerned attendee questioned apartment residents not wanting to pay a fee and instead parking on neighborhood streets. This was met with the reply that luxury apartment lessees will be apt to pay for the convenience of on-site parking. Others questioned how the complex will combat those coming from other towns to park and utilize the nearby train station. On-site security and management, said Rose, will be used to prevent that, much like how the Broadway Commons combats those who park at the edge of the parking lot for the LIRR. “We’re not going to tolerate having people just leave their car for the day,” he said. Other issues voiced included maintenance (Seritage will maintain the complex for as long as they own it), the ability to fill every retail space (Seritage studied the current market and what the area needs), accommodating street widths for fire department vehicles (Seritage will meet with the Hicksville Fire Department to discuss their needs) and controlling traffic flow and speed (raised pavers, traffic circles, etc.). 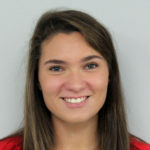 The two-and-a-half-hour meeting saw many more questions concerning parking, safety, respecting the neighboring communities and traffic. A current Draft Environmental Impact Statement answering many of those questions is being reviewed by the Town of Oyster Bay and will be made available to the public upon approval. Subsequent public hearings, such as the one held Thursday, will be planned. Rose stated that if all goes according to plan and the site is approved, construction could take about 30 months to complete. 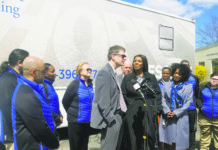 “We have spent a lot of time listening and working with the community and presenting to the community and taking that feedback and incorporating it into the plan to have a plan that we think makes a lot of sense,” Rose said. What do you think of Seritage’s plan for the Sears site? Let me know at aeichler@antonmediagroup.com. Next articleEditorial: Was Amazon’s Price Too High?